There’s still not a lot news for UMass hockey at this point in the summer, however players started rolling into Amherst this past weekend so hopefully we’ll start seeing more coming out of the team soon. In the meantime, here’s some relevant news from around the web. First off, it appears that Joe Manno, who decommitted from UMass in the past month or so, is now committed to go to Northeastern according to his Twitter account. Don’t get too excited yet Husky fans, as he’s still planning on attending training camp for the Sea Dogs of the QMJHL. Remember when committed actually meant, well, committed? Matty V of the Gazette says that the goaltender position will be key for the hockey team this season. Yep, can’t argue with that. Mike McMahon of the Eagle Tribune asks if outdoor games have jumped the shark. I agree that with each one that takes place the uniqueness of an outdoor hockey game lessens. He also asks what happens when someone puts together an outdoor college game and no one shows up. Well, Mike, it already happened. However, while these games will likely begin to fade at some point when the novelty wears off, as a fan of a team who will hopefully play in one of these games this season, I’m psyched. It’s a pretty big deal every year when the UMass baseball team is given a chance to play on the hallowed grounds of Fenway. To have the hockey team do the same will be another great memory of mine in following the program. Now if they could just make it official. There are no specific UMass mentions (other than as a Five College) but this article on the New England prep league from the New England Hockey Journal is an interesting read. Sometime in recent weeks Joseph Manno backed out of his commitment to UMass. This isn’t a huge surprise as his original commitment seemed touch and go with conflicting reports about whether he was or was not coming through at that time. Then there were rumors at the beginning of the summer that Manno was facing problems qualifying academically due to issues regarding transfer of credits from his school in Canada to his prep school in Connecticut. I’m not sure if that drove this decision or something else, but either way Manno will not be suiting up this fall. Coach Cahoon still has a sizable freshman class coming in, so someone should be able to step up and fill the minutes he may have provided. This could open up some minutes for an Andrew Tegeler or Emerson Auvenshine. Reportedly Manno is exploring either catching on with Providence or going the major junior route with Saint John of the QMJHL. Eddie Olczyk, Darren Rowe, and Troy Power are spending part of their summer in Sin City playing in an amateur hockey league there. The No Dome MacTavish’s (obviously a reference to the former Lowell player who was the last NHLer to play without a helmet) is representing Western Mass with two UMass players and three from AIC. Congratulations to former UMass radio commentator Donnie Moorhouse who was named Director of Strategic Sales for the Springfield Falcons. The job seems like a great fit for the Springfield native and former AIC goaltender. Lastly, in the last couple days Fear The Triangle reached 200,000 total views. 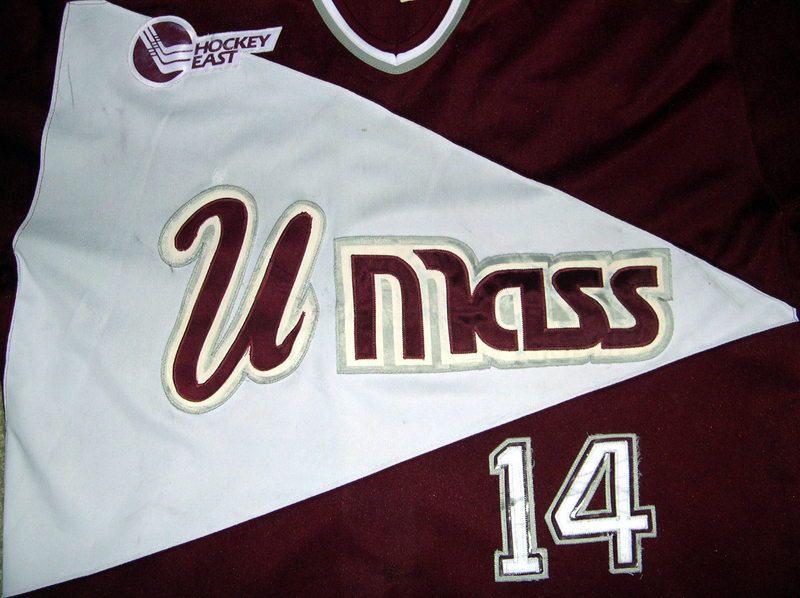 Thanks to everyone for reading and making this place the central place for UMass hockey fans on the internet. Chris Heisenberg passed along the news that UMass picked up a commitment from Junior Bruins forward Andrew Tegeler for next fall. The 6’1”, 170lb right wing is originally from Sewell, NJ. In 44 games for the Junior Bruins this past season he had 19 goals, 21 assists, and 38 PIM. He had 2 shorthanded goals on the season and his 6 game winning goals were tied for second in the EJHL. He was listed as a player to watch for the 2011 NHL draft in the initial rankings from the Central Scouting Service. He was not listed however in the final rankings released earlier this week. It sounds like he has the potential to add some goal scoring for the Minutemen in the future and you especially have to like his ability to score goals that count. Coach Cahoon has had success in commitments coming late in the recruiting season. Adam Phillips and Branden Gracel were both players who committed to UMass after March of last year. As of now UMass will be graduating 1 goaltender, 1 defenseman, and 5 forwards. According to the Heisenberg site, UMass has incoming 2 goaltenders, 2 defensemen, and 5 forwards. However, I have heard that one of those forwards shown on the site as coming next year will likely be coming to Amherst in 2012 instead, though that has not been confirmed. Therefore it appears that there is one player more coming in than leaving and that may indicate that there will be some turnover on the team. Who am I kidding, there is always turnover on the team. At least this year it’s not coming in the form of players leaving for the pros. The fact that an extra defenseman is coming in probably shows that Toot is looking for extra depth at that position and perhaps will be moving Darren Rowe to forward full time next season. I’ll have more on how the team could potentially look next season in the coming weeks. Now on to the regular recruit update. Walsh scored a goal in one of his three games last week. His Saints have a bye in the first round of the USHL playoffs. Yevenko is still suspended and hasn’t played since March 27th. He should be returning early in the playoffs as his Force take on the Lincoln Stars. Shattuck won the Tier-I Under 18 National Championship this past weekend in Simsbury, CT. Gillespie was the 12th leading scorer in the tournament, netting two goals and three assists in the six games. Walsh went scoreless in his one game this week. Yevenko is currently suspended and hasn’t played since March 27th. Here is a Q&A I recently did with Ryan S. Clark. Clark is a Maine grad (but we won’t hold that against him) who writes for the Fargo-Moorehead Forum where he covers the USHL’s Fargo Force and Minnesota high school hockey. His blog, Slightly Chilled, covers all levels of amateur hockey. I started following him on Twitter when the Force’s Oleg Yevenko committed to UMass and was able to get his thoughts on UMass’ towering recruit and other topics. Much thanks to Ryan for his contribution. Fear The Triangle: Yevenko is currently serving a multi-game suspension and was suspended at least one other time earlier this season. Since media coverage of the USHL is sometimes scarce, would you be able to shed any light on what transpired that led to the most recent or earlier suspensions? Ryan S. Clark: Sure. From what I gathered from talking to scouts, he used an elbow and that was enough to warrant a 6-game suspension. He’s got four more games left in the suspension. Oleg’s been suspended quite a few times this season. He’s been suspended twice according to the league’s transaction’s page. NHL and college scouts have both said what hurts him is the fact that he’s so tall that when his elbows move around, they are usually within distance of someone’s chest or higher and there are times where it could be something simple that turns into something worse. FTT: Yevenko obviously plays on the edge in terms of his physical style. Would you say his toughness is an asset overall to the Force or do the penalties and suspensions make him more of a liability? RSC: It is an asset for sure. Fargo is a physical team and it is no secret that they’re going to make a game tough just for the fact that they like to check and get gritty with people. His toughness would also be an asset because he’s so physically imposing. Coach Jason Herter has said about penalties in general that they are part of the game and that these things happen. With Oleg they happen a lot as he’s set the record for most PIMs in a career by a Force player. FTT: How would you describe the strengths of his game? RSC: Aside from size, he can actually move the puck pretty well. His shot is also pretty strong too. His shot is a hard one that when accurate can be tough to deal with. Another strength of the game is his positioning. He uses his frame to make sure he can cover the ice and get into the passing lanes. He can also block a shot too. FTT: What are the areas you think he needs to work on as he sets his sights on college hockey in a top conference like Hockey East? RSC: Speed. He sees a lot of it in practice and in the league, but speed is so killer in Hockey East to where it can be your downfall. He just needs to get faster or continue his adaptation into handling speed when it goes against him. I haven’t seen him get burned at all, then again, he wasn’t going up against the Da Costas of the world every weekend either. FTT: Do you know what, if any, other schools were also looking at Yevenko? RSC: To my knowledge, I am not sure if others were looking at him. Most players tend to be pretty quiet about all that just because they don’t want to burn bridges. But from what I gathered, other schools were indeed looking at him. FTT: How are the Force’s chances to win the Clark Cup? RSC: They’d have to be good but they also have to be consistent. The Force have a ton of talent and everyone around the league knows that. They just have to be consistent when it matters. The thing that helps them is that entering last weekend, they were tied for the most road wins in the USHL with 19. Bad news is, they have an average home record. If they can win those home games they can be back in the Clark Cup Finals for a third straight year. FTT: As someone who covers both the USHL and Minnesota High School hockey, how would you compare the level of play of the two? RSC: Great question. In truth, they are different. The USHL is a faster, physical league that relies on talent and/or systems to win games. That and the defense and goalies on this level are far better than what you see in Minn. HS. Another thing about the USHL that makes it different is the skill level. Take a guy like Force forward Joe Rehkamp for example. He played at Breck in Minnesota and kid was easily the fastest skater in the state. He comes to the USHL where he uses his speed to kill but it hasn’t translated into a lot of goals like it did in high school. That said, Minnesota HS hockey is very good. There is talent there and it is a great place for recruiters to go. MNHS is like any high school sport where you have a balance of power and the power is pretty much with the schools in the Cities (Minneapolis-St. Paul and its suburbs.) Schools like Eden Prairie, Edina, etc. are in locations where kids can train year round and go against the best competition whether it be in the fall with the Elite League or the regular season. Then there are outstate schools like Duluth East, Moorhead and Roseau that get respect and work hard too. They also have kids in the Elite League but they are few and far between compared to the Cities schools. There is talent that can make the jump from HS to college, but most of them need the USHL or any junior league for that matter to make the transition. FTT: UMass recruit Kenny Gillespie is playing for Shattuck St Mary’s in Minnesota. Have you seen him play at all and what do you think of his game? RSC: I have not had a chance to see him play but I have been following Shattuck because how can you not? They don’t play the public schools, which is something most people outside Minnesota do not know. But know this, if you are playing at Shattuck that is saying a hell of a lot because they don’t just let bums walk into that place. If UMass or any school has someone that is at Shattuck right now, congratulations. You know that kid is going to come in with talent but more than anything, work ethic. FTT: UMass recruit Shane Walsh is playing for the Dubuque Saints of the USHL. Have you seen him play at all and what do you think of his game? RSC: I’ve seen him a few times this year and he’s not a bad player at all. He’s got some speed about him, which is a plus. The times I’ve seen him, he’s been good but just has had a hard time getting scoring chances. A lot of that has to do with the fact that Dubuque has some monsters and one guy you’re going to hear about if you haven’t already is John Gaudreau, a Northeastern commit. He’s uber talented. Going back to Walsh, he’ll be a good addition for UMass because he can play defense and he doesn’t make a lot of dumb decisions. He’ll be a hardworking forward for them. FTT: Lastly, how in the world does a Maine alum end up covering amateur hockey in Fargo, North Dakota? RSC: My goal is to cover the NHL and you can’t say you want to do it covering Texas HS Football like I was doing before I moved to Fargo. The Forum had an opening and I told myself that if I was serious about getting back into covering hockey I needed to make this move. Things have worked out to this point and that’s why I am here. Fargo is great and I enjoy being here. But I know there is an end all goal and that is the NHL. I grew up a hockey fan and I always knew I wanted to cover it. I covered the women’s team at Maine for two years and Hockey East women for a year at USCHO.com while I was a senior. My last two jobs got me out of hockey but I really missed the game and covering it. So I made a choice. I don’t regret it at all. Coming to Fargo has been the greatest experience of my career and I know it’ll lead to bigger things. There’s an old African saying, "You can’t hide the sun with your hand forever." My time will come, I know that. The UMass Athletics site has another entry to Chase Langeraap’s blog following his first journey into pro hockey. Staying in the ECHL, former UMass captain Dean Stork was named runner-up for the league’s Coach of the Year award. Stork, in only his first year as a head coach, led the Greenville Road Warriors to the second best record in the league. The weekly recruit update is a day later than usual because I chose to go to the tremendously disappointing UMass lacrosse game at Harvard last night. For those who missed it, UMass was up 8-4 in the 3rd quarter only to have the Crimson score 7 of the last 8 goals to take the win. It was sad to see a UMass lacrosse team fold that way and be missing the usual fire we’ve come to expect from Greg Cannella coached teams. One positive on the night was my first trip to Cambridge Common where I enjoyed a Pretty Things Fluffy White Rabbits (probably my favorite Pretty Things beer) and tried Long Trail’s Triple Bag for the first time. Anyway, on to the future Minutemen. Gillespie’s team didn’t play this past week. This coming weekend Shattuck will be playing in the Tier I National Tournament in Simsbury, CT. I’m going to do my best to juggle my weekend schedule enough to try to see him play. Walsh went scoreless in his three games this week. Yevenko had 16 PIM in his last game. He’s still 2nd in the league in that category. UMass isn’t mentioned but a blog I just discovered, Slightly Chilled, has an early look at the best recruiting classes in college hockey for next year. Ryan Durling of Sieves The Day wrote a good analysis of how much scoring each Hockey East team is bringing back next year which, on paper, bodes well for UMass. I did similar number crunching myself, but only looking at scoring in conference games, so as to have an equal sample size to compare teams. Of the players coming back next year (as of now), UMass has the 4th, 7th, and 10th leading scorers from this past year with T.J. Syner, Danny Hobbs, and Mike Pereira respectively. To tell you the truth I was completely torn between Atkinson and New Hampshire’s Paul Thompson. Atkinson had 24 goals in conference play, Thompson 23. Thompson had 42 points, Atkinson 38. Really, I found it tough to say definitively one was better than the other. The tie-breaker? How did they do when the two teams met in the last weekend of the regular season and the title was on the line. Atkinson had three goals and one assist. Thompson had just one assist. Enough said. If I have to explain this one it means you haven’t been paying attention. This probably looks like a homer pick, but hear out my reasoning. First, he led all freshmen in goals in conference play. Not only that but he led the Minutemen in goals as well, accounting for 15% of the team’s total output in conference games. He even led the Minutemen in +/- in those games with +5. He was one point behind BU’s Charlie Coyle in league points for freshmen playing in one less game. I can pretty much guarantee that Pereira won’t win tomorrow because unlike Coyle he’s not a high NHL draft pick playing for Boston University, but tell me which freshman had a bigger impact on his respective team? In fact, I wouldn’t even put Coyle as runner-up in this award, instead giving that honor to Northeastern’s Jamie Oleksiak who absolutely shut down opposing offenses for the Huskies. As mentioned, Hockey East did announce some award winners and congratulations goes out to Mike Pereira who was named to the All-Rookie team. Pereira and BU’s Coyle were the only unanimous picks to the team. Paul Dainton was named a runner-up to the Len Ceglarski Sportsmanship Award (much to the chagrin of WCHA officials). Recruit Steve Mastalerz and Joe Manno (who is rumored to have committed/recommitted to UMass) will be teammates in the Beantown Classic tournament that takes place this week. The Big Ten Hockey Conference could become official as early as next week, thereby destroying college hockey as we know it…if you believe some WCHA and CCHA fans (which I don’t). Make sure to check back later tonight or tomorrow as I plan to have my season recap very soon. Boyle’s Westside Warriors are currently down 2-1 to the Trail Smoke Eaters in the first round of the playoffs. Boyle has started all three games, giving up 5 and 4 goals in the two losses and only allowing 2 in their one win. He has a goals against of 3.66 and a save percentage of .881 in the playoffs. Though to be fair he could use some help from his special teams as the Smoke Eaters have scored 7 power play goals on 13 chances, including four of four opportunities in last night’s loss. Game 4 will be played tonight. Shattuck should’ve started playing after a few weeks off but Gillespie’s stats haven’t been updated. Unfortunately LaRue’s season has come to a close as his Waxers lost in the first round of the playoffs. He had a goal and four assists in five playoff games, including a game winner and a shorthanded goal. As soon as I can find a site that has New England Prep stats that doesn’t cost $130 a year, I’ll do my best to update his stats. I do know the prep regular season is over and the playoffs start soon. Walsh didn’t have any points on the weekend . His Saints still have the best record in the Western Conference. I know I previously wrote that Joseph Manno committed to UMass for next fall. I did so after two different sources indicated that it was so. However since then I’ve yet to confirm it independently and am hearing maybe he committed and backed out or never committed in the first place. Either way I’m very sorry for reporting that he was coming if that ends up not being the case. While I stand behind my sources in this case as they both seemed solid, the last thing I want to do is spread incorrect information regarding the team. Rachel Lenzi of the Portland Press Herald has a look at how the Hockey East standings could shake out. Rachel covers the Maine hockey team and is a great resource to follow for news on the Black Bears this week. Another Maine paper though is already talking about the playoffs even though there’s a weekend of hockey to play before then. Cart. Horse. UMass, and specifically it’s tough time in one goal games, is mentioned on NCAA.com. USCHO also looks at how the Hockey East standings could finish. 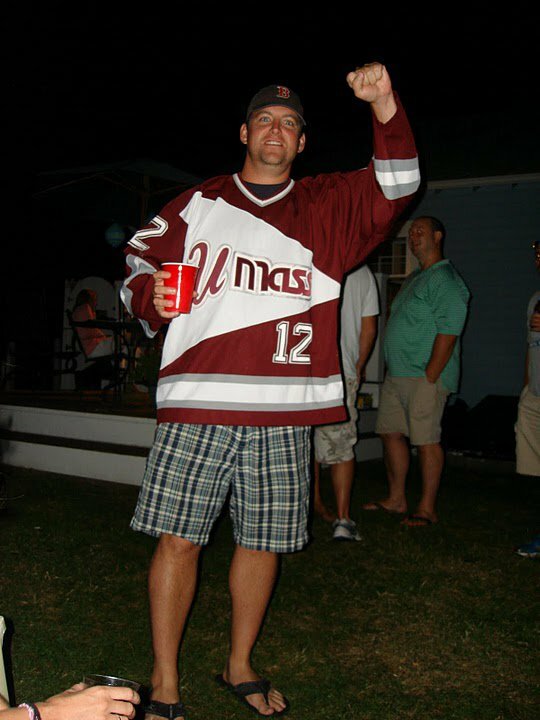 As I wrote last year, the triangle jersey has become the UMass hockey fan’s rally cap, to be pulled on when things look dire and the team is in need of divine intervention. Despite the struggles of this year I’ve refrained from my calling of triangles. Sure I thought about it after Merrimack put up double digits on the team (something that didn’t even occur during the 90’s) or when they dropped the season series to Providence. But for the most part this team, despite their lack of wins, was surpassing expectations. Remember, they were picked to finish out of the playoffs, as low as last place in Hockey East by some around the league, but have spent most of the year sitting in 7th place. They’ve slipped a bit and find themselves in 8th now and some really bad things would have to happen both at home and around the league for them to miss the playoffs. But the chance is there and so it’s time to do our part to make sure UMass doesn’t miss the playoffs for the first time since 2001-02. So get your hands on a triangle for this weekend’s games. Pull them out from the back of the closet. Pick them up from the dry cleaners. Buy one on eBay. Borrow from a friend. Hell, you can even try to take the triangle right off Craig MacDonald’s back if you can find him. But wear your triangles come this weekend. Let’s see if the tri-cornered magic can guide our Minutemen into the playoffs, to the Garden, and beyond!